Butoh is an enigma, an ever-evolving mystery. Violent or peaceful, slow or manic, painfully intimate or grandly spectacular, freely improvised or choreographed in stylized gestures, Butoh seems to fly away from itself, resisting definition or explanation, yet profoundly transforming those who encounter it. 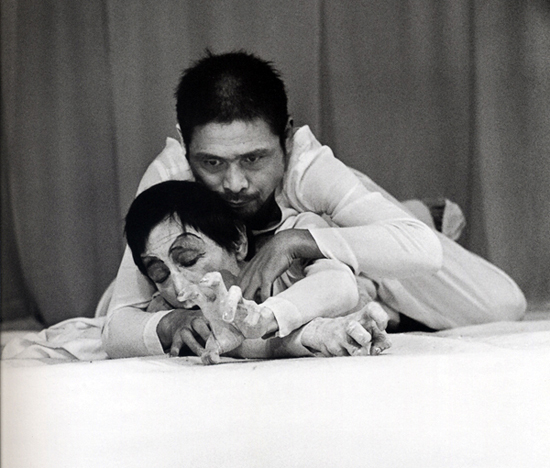 Butoh’s founders, Kazuo Ono and Hijikata, trained in Western dance and in the German Neue Tanze tradition. They searched for a way of moving that better fit their bodies, that was distinctly Japanese without being traditionally Japanese. In seeking a Japanese dance, they discovered something universal, a new art form, neither theater nor dance, that offered a way to overcome the distance between the dancer and the body and between the body and the universe. Convinced that the exploration of forbidden sexual passions could free the body from artifice, rejecting dance as self-expression and drawing inspiration from nature and from the imagination, from the crippled and the blind, these early Butoh pioneers gave birth to something that has revolutionized art. Today, Butoh has spread throughout the world and continues to develop in ways its founders could never have foreseen. Tatsumi Hijikata (1928-1986) was a central figure in twentieth century arts. 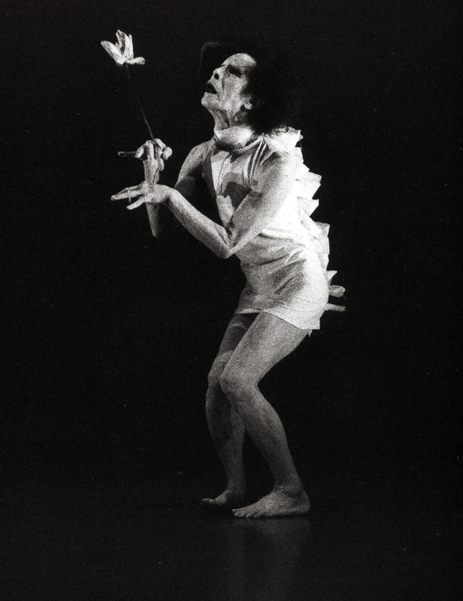 Mercurial and restless, he developed several different styles of performance that have come to be called Butoh. His early work, influenced by the writings of Genet and Artaud, was sexual and chaotic, violent and improvised, and lead at one time to his being banned by the Japanese Dance Association. By the late sixties he had begun to develop a new dance, highly choreographed with stylized gestures drawn from Hijikata’s childhood memories of his northern Japan home. It is this style which is most often associated with Butoh by Westerners. Drawn to the mysteries he saw revealed in the female body, Hijikata began in the early seventies to work intensively with a few women dancers, most notably Yoko Ashikawa. Here Hijikata developed his famous style of work in which he would speak to the dancers, improvising through a repertoire of hundreds of images, transformations that the dancers would move to. By all accounts, Hijikata’s collaboration with Ashikawa produced some of the most magical moments on a twentieth century stage. Through the early eighties, Hijikata withdrew from performance and assumed a mentoring role behind the scenes, nurturing many butoh artists. Just as he began to work again his life was cut tragically short in 1986. Kazuo Ono (1906-2010) collaborated with Hijikata in the earliest days of butoh, before it even was butoh, and continued to work with Hijikata periodically until Hijikata’s death, yet his art took a very different route. The heart of his work remains improvisation, striving to reveal the spontaneous life of the universe in every moment. Unlike most butoh artists, his work is full of emotion, yet still rooted in the vivid internal imagery that is the hallmark of the form. He is often described as the light that contrasts the darkness of Hijikata’s Ankoko Butoh. Ono stopped performing for many years, but returned to the stage in 1977 at the age of 71, inspired by a painting that reminded him of a glorious dancer he had seen as a youth. The performance that came out of this epiphany , “Admiring La Argentina,” is among Ono’s most famous. Even into his late 90’s, Ono remained a solo artist of unparalled expression and depth. He turned 103 in October of 2009, and though confined to a wheelchair, his spirit was still strong and his hands still danced. Though he never directed his own company, he was renowned the world over as a teacher and through his classes and performances he profoundly influenced several generations of dancers.